This is drive safely commercial for Auckland's Rodney District is an amazing piece of work. Truly amazing. Not as technically amazing as Honda Cog or as emotionally charged as the classic The Faster the Speed The Bigger the Mess (which you can view here) but still, amazing. Saatchi New Zealand, working with production company Flying Fish and a demolitions engineer, blew up a car with ten grenades and then reassembled the vehicle, piece by piece, creating a work of art. The finished piece is stunning. And the music. Well, that works too. Many drive safely commercial go the death and dismemberment route. 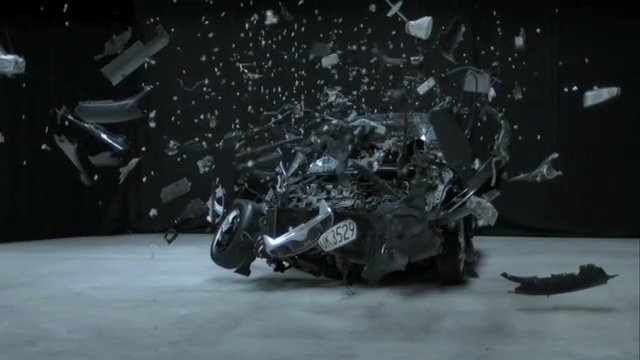 This commercial doesn't But it does demonstrate the damage a high speed crash can do to a car. And by extrapolation, the inhabitants within. And it does it beautifully, if hauntingly so. But if you really want to test you emotions, check out this collection of gut wrenching drive safely commercials. You'll be a mess afterward.